The word “charisma” comes from the Greek, meaning “divine gift”. JFK had it; Winston Churchill had it, Charles De Gaulle had it. 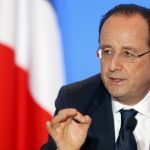 French President François Hollande does not…and that, according to French popular opinion, is his biggest flaw, one reason the country is mired in an economic swamp, with unemployment stuck at more than 10%, a budget deficit hovering close to 95% of GDP, and reforms pushed further into the future.